Are you torn between prioritizing a huge tank capacity or a quieter model? Well, guess what? You can actually have both in one single air compressor. 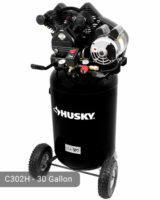 Husky 30 Gallon Air Compressor C303H model is a combination of both powerful and silent air compressor. 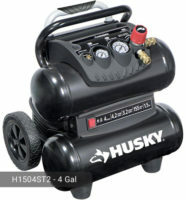 The air compressor is powerful because it has a high-performance motor that can deliver a maximum of 175 psi. Air delivery is 5.1 SCFM at 90 psi. Because of these output, the machine becomes more efficient and can run air tools at a longer period of time. It is quiet compared to other brands with the same tank capacity. Running at only 78 decibels, your work environment is guaranteed to have a lesser noise. Despite its huge tank size, it is still portable because it has 9-inch wheels that can run along all kinds of surfaces. It also has a handle with a rubberized grip so you can transport it from one place to another. Its vertical design can save a lot of space in your garage or shop. 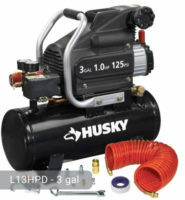 Husky 30 gal air compressor has dual quick connects which make it easier and faster to switch from one tool to another. It can run several types of nailers and spray guns. Some of the tasks that can be performed by this model include but are not limited to: finish nailing, roof nailing, spraying, hobby painting, automotive light-duty tasks, and inflation purposes. The tank is made of steel and is ASME certified so 100% safety is guaranteed. Because of its capacity, it is heavier compared to other models (105.25 lbs). However, as mentioned, it is still portable. This model in contrast to the C302H model, is oil-free so you need not worry about oil leaks and residue. It is equipped with a high-flow regulator that ensures maximum delivery of air to the tools that you would like to be powered. The air fittings are universal so you can plug in a wide array of tools. The pump has automatic shut-off feature when it has already reached the maximum pressure. 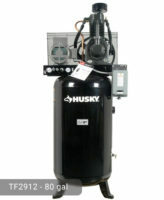 Husky C303H model has two gauges that can help monitor the level of air pressure. There is also a bleeder valve which facilitates a quick air release on the bottom of the compressor. The tank fills quickly so you can also finish your task in a shorter period of time. No set-up is required for this air compressor. Upon purchasing, you just need to plug it in a 120-volt electrical power source, switch it on, and you can already use the machine. You do not even need to move a bolt or screw. Sounds convenient, right? Husky 30 Gal. 175 psi High Performance Quiet Portable Electric Air Compressor is perfect for consumers who want a powerful machine that operates quietly. At only $299.00 in your local store, you will invest on something that will last long. 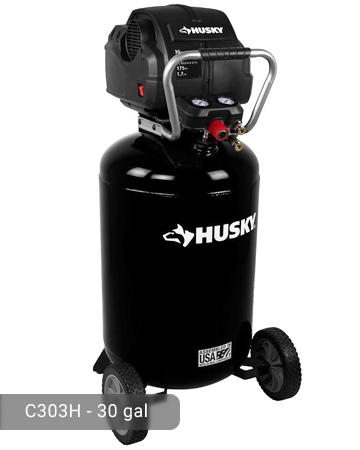 The air compressor is well-built with all the safety and unique features that you need. If you already own Husky C303H model or just want to buy it, feel free to share your review or ask a question through the form below. How should I register the warranty information? 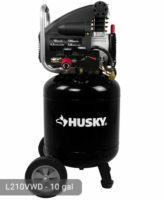 I purchased HUSKY model C303H Air Compressor 2 days ago. It was the last one at the Pace, FL Home Depot. The output Air Pressure does not Exceed 125 psi (Per the output gauges). It pumps up to 175, but the regulator only allows a max of 125 psi?? WHY? It states this compressor is recommended for an Impact wrench, but DOES NOT have enough power to turn any of the Lugs on my mid-size SUV. This is FALSE Advertisement. The fact that HUSKY only allows 125 PSI Output on this model should have been the indicator that it’s not strong enough for ANY IMPACT WRENCH/Gun. Further, The Air flow adjustment knob is difficult to turn and is far too close to the hose connectors resulting in added difficulty in turning the adjustment knob. Poor Ergonomics. Also, this model did not come w/ a foot bar to assist in tilting the compressor which makes it difficult to move. I don’t know who designed this model or if all Husky compressors have issues, but I’m not too happy because I have to load it back up, drive 20 miles, go through the hassle of the return process and basically monopolize 1/4 of my Saturday. Where is the PDF of the manual???? What is the filling time from the empty tank to the full 175 psi? It will take approximately 10-15 minutes to fill the tank when completely empty. That time is significantly reduced when using air tools after the tank has been filled. It ill cut-out at 175 PSI and cut-in at 125 PSI which reduces the amount of time to fill the tank. If you’re operating the unit in a humid area or an area where it is very moist, the tank will have to be completely drained after use. I’ve had this compressor for a few months and I noticed today that once the tank reaches 175 psi, the compressor shuts off and then pressure slowly drops to 165 psi and then stop. Is this normal? I’ve tried soapy water to make sure there is no leaking air at connections and joints, and haven’t seen any. Mcarman, If you look under where the tank pressure gauge is, there is a small rubber hose that connects there. If you haven’t already, spray soapy water on the end of this little hose that connects to the gauge. There is a hose clamp on there that isn’t the best and can be replaced with a higher quality one. Mine does this and it is leaking from that spot. It just isn’t an issue for me to want to fix it. Is this plug and play into any electrical socket or is getting a breaker installed necessary? It requires 15 amps per the specifications. Most residential outlet and lighting circuits are 20 amps using 12 gauge wire. So this should have no problem plugging into a standard household circuit. That being said, you should check the circuit that your room (I assume garage) is on. If they only ran 14 gauge wire and it’s a 15 amp circuit, you could potentially have a problem with the breaker tripping, particularly on startup. I’ve had mine for 2.5 years. Twice in the past week it started shutting off. I put a fan on it to try and cool it off. 5 mins later i plugged it back in and ran for 5 mins and shut back off. Surely the motors not bad uet. Right? Van, I can tell by your comment that you have no idea what you are talking about. Hardly any air tools run higher than at 90 psi, an impact requires a certain cfm at 90 psi to run effectively, it is possible that your impact requires more than 5.1 cfm at 90 psi to operate properly. In that case you need to get a new impact that will work on 5 cfm or below. I purchased this compressor and I have a 750 ft lb impact that operates on 5 cfm and this compressor operates it perfectly. I can remove the nuts off of all 4 tires with out the compressor even coming on because of its 175psi capacity. I have removed rusted bolts etc.